Great 45pcs Auto Clips Retainer Assortment Set With 11pcs car cable ties，which fit for most cars. Our Auto Clips Set will bring you the most satisfactory service and experience, please rest assured to buy!!! 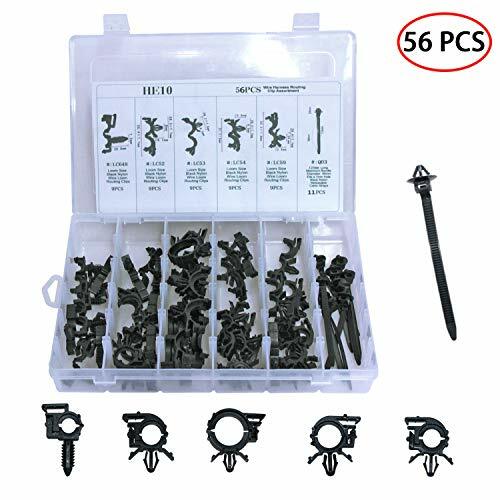 56 PCS CAR WIRE ROUTING CLIPS KIT - Our Auto Wire Routing clips kit includes 56pcs contains 5 different sizes car clips and 11 pcs car cable ties for Honda GM Mazda's car trim panels, door trims, door panels, bumpers, fender clips, hood and splash guard retainer replacement.Satisfy everything you need to save you time and money. DURABLE MATERIAL - Our Wire Harness Routing Clip Assortment set are made of high quality material.More stronger,robuster and vibration resistanter,would not break or crack easily. MOST COMMON SIZES: Our auto clip wire loom routing clips rivets are made of nylon material for precise replacement.Don't worry about lost or damaged body fasteners.Suitable for most of the car use. UNIVERSAL FIT FOR NISSAN - The Car Body Clips are are sized and shaped to fit your requirements.Meet all your needs. SATISFACTION GUARANTEE - Please check the size of the prouducts pictures,type and shape to make sure the item is the one that you need.If uou have any problems ,take time to contact with us,we are in 24 hours service! If you have any questions about this product by ROLINGER, contact us by completing and submitting the form below. If you are looking for a specif part number, please include it with your message. Kust wm38463w Car Rear Door Trim Kit,Tail Door Edge Trim fit for Honda 2015 2016 Crv,Pack of 1 Piece of Exterior Door Chrome Trim.